WHEN GEORGE WASHINGTON chose a plan for the U.S. Capitol in 1793, the promised building seemed destined to last. Yet it was a welter of problems. It was too small to accommodate all of the government bodies crammed under its roof: the Supreme Court, the Library of Congress, the offices of the Vice President, and the commissioner of public buildings as well as the House and Senate ranks. The Senate chambers were sweltering in the summer, and in the winter dignitaries wrapped themselves in shawls to ward off the cold. The House’s problems were even more acute: the horrible acoustics made the chamber a “perfect Babel of sounds,” groaned one congressional investigator. In 1817, President James Monroe selected a Boston architect, Charles Bulfinch, to make some fixes to the beleaguered building. But Bulfinch failed to ameliorate the House’s acoustical defects and saddled the edifice with an ill-fitted dome that “swelled skyward like a thumb that had been whacked with a hammer,” writes Guy Gugliotta. Gugliotta’s excellent new book traces the seventeen-year effort to build a more fitting extension to the Capitol, an endeavor complicated by conflicts of both personal and national scope. But construction was not simply a matter of presidential fiat. Gugliotta makes much of the fact that Jefferson Davis was the project’s chief “political champion, benefactor, and shepherd” until he left Washington in 1861 to lead the Confederacy. Davis’s identity as a Southerner and advocate for the construction of a national centerpiece is curious, though arguably more so with our knowledge of how polarized these positions would eventually become. Gugliotta suggests that Davis’s abiding interest in the Capitol was due to his education and military experience—he commanded a Mississippi regiment in the 1848 war with Mexico, which positioned him to appreciate the breadth and the potential of the United States in a way few Americans could. Still, a number of Southerners backed the Capitol extension as secession and war threatened. Gugliotta emphasizes—it is, alas, a timeless theme—how extraordinarily difficult it is to complete an ambitious public project, particularly when one’s overseer is as riddled with “monstrous egos” and indebted to private interests as Congress is. For no sooner had President Fillmore presided over the laying of the cornerstone of Walter’s extension in July of 1851 than Walter was forced to submit to the acrobatic process of securing an annual budget appropriation. That “lawmakers wanted a fabulous building, but they also wanted to look humble to their constituents by refusing to pay for it” would bedevil the extension’s leaders for the duration of the project. Walter was slow to grasp another enduring feature of high-profile business in Washington: the importance of gaining political patronage. As Fillmore’s tenure drew to a close in 1853, Congressional sharks circled in a bid to oust Walter. They succeeded, stripping him of his title as building supervisor and project disburser, though he retained the title of architect. Stepping into his managerial shoes was Montgomery C. Meigs, an ambitious army engineer and a protégé of Jefferson Davis, the new Secretary of War. Meigs had a few distinct quirks of personality, and a prodigious self-regard was one of them. (He also had a fascination with snakes, and kept a supply of live ones in his office in the Capitol: a serpent on a sizable bronze doorknob leading to the House of Representatives was modeled on one of Meigs’s quarry.) History would show that his belief in his abilities was not unwarranted. Meigs developed a grand artistic plan befitting his and Davis’s vision for the building, commissioning statues for the pediments of the porticoes of each new wing and adding a hundred marble columns to the facade. He decided on frescos, papier-mâché, and encaustic tiles for the interior, and hired some of the most accomplished artists from around the world to create them, despite significant anti-immigrant sentiment. Walter, still attached to the project and no slouch in the ambition department himself, contributed a design for a cast-iron dome to replace Bulfinch’s “rotting fire hazard.” Meigs praised the idea and it quickly won support, but relations between the men were never better than uneasy. The tension erupted into a full feud in 1858, when Meigs issued a set of blueprints crediting himself as the extension’s architect, not Walter, who had been listed as such in previous versions. (As if to dispel any doubts about his role, Meigs inserted copper plates bearing his name into masonry and fixtures around the Capitol.) Gugliotta makes fine use of the leaders’ copious diaries and correspondence to bring these emotional struggles to life. Meigs managed to hold onto his post for a few more years, though the reins of the project would revert to Walter in 1862. By that time Meigs had moved onto the greener pasture of the battlefield, earning accolades for his service in the Union Army. 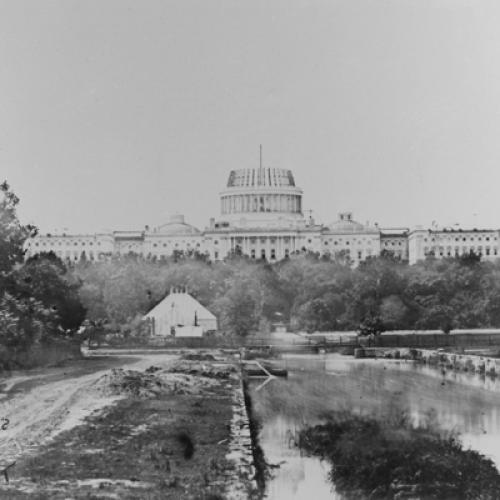 In 1861, the unfinished Capitol was commandeered as temporary army housing, and the soldiers made a playground of the hallowed space, fastening ropes to the cornice of the unfinished dome and swinging across the battered rotunda. Lice took up residence in the Senate chambers—every “hole and corner is defiled,” Walter moaned in a letter to his wife. Eventually the soldiers departed, but that was not the last wartime action the Capitol would see: it was turned into a hospital later in the war. Walter’s diary indicates that he tolerated this, although he moved his office outside on account of the smell. Lincoln earned the praise of history for supporting the Capitol’s continued construction as the North and South fought; the dome was crowned in 1863, and the extension’s finishing touches were completed five years later under Walter’s dutiful command. Yet the headstrong men who had led the development of the stunning building remained divided. Though he lived for decades after the war, Jefferson Davis never laid eyes on the Capitol, and he attempted to distance himself from its origins as he cultivated the mythology of the South’s “Lost Cause.” And when his wife Varina Davis wrote his one-time protégé Meigs requesting news of her husband, then imprisoned by federal troops following his capture in southern Georgia, Meigs ignored her frantic pleas.